How is ACL Surgery Performed? The tear is examined. A healthy ACL is taut with very little laxity. In contrast, a torn ACL is loose and allows excess mobility of the femur on the tibia. When arthroscopically examining a torn ACL, an orthopedic surgeon uses a a fiber optic camera placed throughout small puncture wounds made in the knee and a small metal instrument called a probe, is used top evaluate the status of the ACL. Illustration 1- The ligaments of the knee. A normal ACL is a taught “rope” that provides stability. The torn ACL is removed. 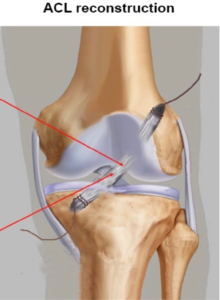 In order for the ACL to be reconstructed, the torn or damaged portions of the ACL need to be removed. This goal is accomplished by the use of a tiny shaving device. The tissue graft is passed through the tibia and femur. Small holes are drilled into the tibia and femur in the location of the previous ACL. Through these holes, the tissue graft is passed and then secured with interference screws or a button type of device—acting as a new, taught structure that restores joint stability and allows for ligamentous growth/reattachment to occur over the course of 6 months to a year. The procedure usually takes 1-2 hours depending on the severity of the tear and the presence/absence of a meniscal tear. Patients are usually sent home shortly after the procedure. Physical therapy can be started as early as the next day after of surgery. After adhering to the advice and treatment of their surgeon and physical therapist, patients can expect to return to competition/activity in six months to a year. Dr. Nicholas Alexander is the Founder of Mahwah Valley Orthopedics and a Board Certified Orthopedic Surgeon specializing in both the surgical and non-surgical treatment of hip and knee conditions. Dr. Alexander completed his Fellowship in Adult Reconstruction and Reconstructive Surgery of the Hip and Knee at the Johns Hopkins School of Medicine. He also serves as the Chairman of the Valley Hospital Total Joint Center. Dr. Alexander has offices in Mahwah and Clifton, NJ. If you, or someone you love, is considering treatment for an ACL tear, contact us today for a consultation.